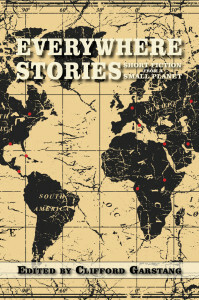 Everywhere Stories: Short Fiction from a Small Planet: Volume III now open for submissions! As an internationalist, I’ve always been interested in fiction set outside the United States, whether it’s literature from another country translated into English or work in English set overseas. If it’s done well, the reader will usually learn something. It’s like traveling without leaving the house. Several years ago I got the idea of an anthology of short stories set around the world. Press 53 agreed to publish the first volume and we opened for submissions in the fall of 2013. We were overwhelmed–in a good way. That first volume was published in the fall of 2014 and won some awards, including an International Book Award. The book’s success convinced the publisher to proceed with a second volume, which came out in the fall of 2016. It too won an International Book Award as well as Indie First awards in two categories. And now it’s time to start putting together the third volume in the series. As of today, October 1, submissions are now open, through November 30. There is no minimum or maximum length. Stories may be previously published. The only real requirement is that we will not publish stories set countries already covered by Volumes I or II, so please read the submission guidelines carefully. To read the submission guidelines and submit, please go here. Congrats! I didn’t realize your series had won so many awards. Wow!